Citation: Monroe N, “Connectivity Using Consumer Technology to Create Real Value for Patients”. ONdrugDelivery Magazine, Issue 95 (Feb 2019), pp 10-15. Napoleon Monroe presents the case for the C-Container, a collective term for a theoretical class of consumer product designed to work with various drug delivery combination products, to provide the benefits of connectivity to the patient and sidestep the regulatory and development challenges that surround fully integrated connectivity, to the benefit of all stakeholders. This article covers the potential for connecting drug delivery products, especially combination products, to the internet in ways other than designing them from the ground up to have integrated connectivity, making the device fully a “connected combination product”. Combination product development is already difficult, and connected combination products face even more challenging, sometimes tortuous, regulatory and corporate paths. Pharmaceutical companies and their supply chain partners (hereafter referred to simply as “pharma”), regulators, payers, healthcare providers (HCPs) and patients are five of the most important stakeholders in drug delivery. In the current environment and given the immature state of connected combination products, the goals of these stakeholders are different, sometimes irreconcilably so. 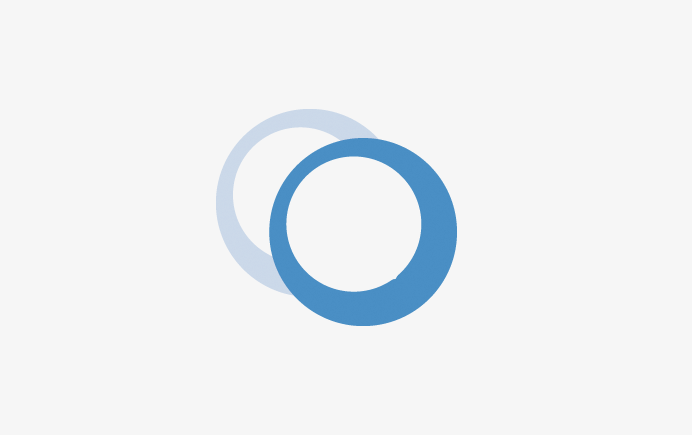 Our premise is that providing truly patient-centric information to meet patient needs should be the primary aim of connecting a combination product. The following is a discussion of a theoretical connected container for a combination product, which we shall refer to as a “C-Container”. 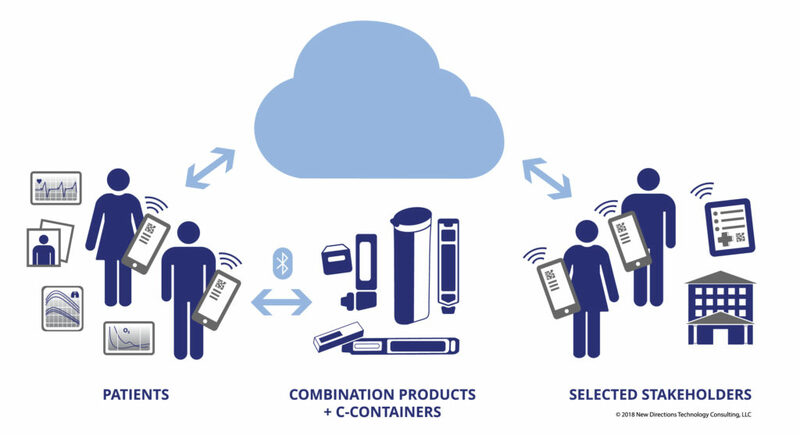 A C-Container is an internet-connected consumer communications product, medical device data system (MDDS) or any truly patient-centric means of connectivity that can be used in association with various drug delivery or healthcare products. A C-Container may be for a pen injector, autoinjector, inhaler or any other dosage form, and would usually include appropriate apps for use with a consumer communications device such as a smartphone or tablet computer. Ideally, no C-Container should require extensive regulatory involvement for use. The C-Container itself may or may not be a medical device, may physically contain or cover (in whole or in part) its associated combination product (or other dosage form) or may take another form not discussed in the scope of this article. A C-Container and its related software ought to be regulated in the least restrictive way legally and ethically feasible, preferably as a consumer product, or another type of product which is not regulated in an unduly restrictive manner. An expertly designed C-Container could provide greater value to patients than a sophisticated, industry-centric, highly-regulated connected combination product. While an HCP can diagnose a patient’s ailments and then recommend the best therapy for their care, they generally do not have the time, workflow systems, information, training or payment incentives to deal with a patient’s ongoing compliance with their treatment, or most of their other day-to-day needs and frustrations. Pharma, HCPs and payers want to generate revenue and limit cost. Even with all the talk about models for creating shared value, ultimately all three of these stakeholders have to remain cost conscious and revenue driven. This can sometimes slow innovation in pursuit of patient-centric connected combination products.1 The culture of pharma and healthcare administrative practice tends to be very cautious and slow-moving, whereas consumer culture is quick and agile by nature. Ideally, product lifecycles for pharma and medical device products take the course of several years. Compare this with the product lifecycle for a consumer software product. It may be years for the brand, but with constant evolution and updates to adapt to shifting markets, or even requests from individual users, the lifecycle of a specific software product (or product version) is often only months or days. Pharma is typically risk averse and product introductions are highly time sensitive. To speed along drug approval, and for other reasons, pharma may wish to exclude connectivity in their early drug filings, or even entirely. When a connected combination product is filed, the US FDA considers the entire product, which could put a connected combination product in a never-ending loop of regulatory inquiries and change management. Consumer medication telemanagement software can be flexible and can be modified often, and in some cases the software may even be patient specific, which does not mesh well with the way regulators examine product filings. Furthermore, mergers, acquisitions and new entrants into the pharma space are bringing new conflicts and disruptions, which may necessitate software changes during a connected combination product’s development. Some consultants may say it is best to avoid developing combination product injectors for emergency use because such a product must deliver the dose in the therapeutic range with near 100% reliability. Exactly how near can be a difficult question, especially when human factors are considered. Whilst it is true that preventive therapy would be better for patients than treating an emergency, emergencies do happen, and patients often need more assistance in an emergency than in non-emergency situations. 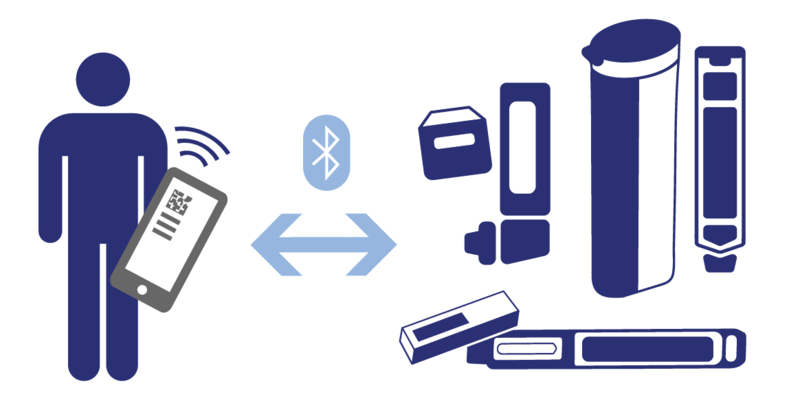 Therefore, the benefits conferred by connectivity can be especially important for emergency products, whilst the task of developing a connected combination product for emergency use is even more daunting than for those used in preventative therapy. Healthcare will not, in the foreseeable future, eliminate the need for direct patient interaction, nor should it. Access to mobile patients is difficult. However, providers, payers and pharma want select, automated, near real-time, clinically based information they can use as and when they want it. Selecting what is needed and desired is difficult and varies situationally. Even when other stakeholders have virtually unrestricted access to a patient, for example when they are in hospital, the quality of collected patient data is often poor. In the real world, the use of many poorly co-ordinated electronic medical record (EMR) systems for a single patient limits the usefulness of their data. On top of which, gathering, recording, screening and accessing all appropriate clinical information results in greater regulatory and administrative scrutiny, which can present an extreme burden. Regulators are mandated and expected to ensure safety and efficacy. They do not want to be blamed for failure, and thus a large part of a regulators’ self-interest lies in staying out of trouble. One way to do that is to approve products in an extraordinarily cautious way, or not at all, in order to avoid becoming responsible for the unanticipated problems that may occur.2 Regulatory issues go a long way towards explaining why pharma cannot easily execute on the various business cases that advocate for a connected combination product. As with most bureaucratic institutions, regulators may not move quickly. Pharma regulators have difficulty dealing with combination products and even more difficulty dealing with the greater number of “what-ifs” associated with connected combination products. Legacy regulatory systems were not structured to deal with the frequent changes typical of consumer software systems. Add to this the fact that there are divergent definitions in various countries of what constitutes a combination product and how to regulate software, and it becomes clear that getting a connected combination product approved by the regulators may well end up becoming a very difficult task indeed. Patients, on the other hand, do not particularly care about regulations; pharma, HCP or payer revenue or cost; or about HCPs’ time. Patients care far more about treatment availability, quality, expense and, most importantly, outcomes. Patients are suffering ever-higher co-pays and are confused about the complicated payment, coupon and rebate schemes foisted on them. Patients also have become far less trusting of the other stakeholders, especially the non-HCP stakeholders, which limits the ability for pharma and payers to influence patient behaviour. Patients want real-world, actionable information that they can easily put to use. The successes of many consumer internet-connected products demonstrate that consumers are willing to pay for what they perceive as real value in these products. The rapid uptake of smartphones by older populations shows their openness to technology when it is clearly in their interest. Older patients consume more healthcare and medications so, as with all segments, keeping the technology simple and focused on their needs is key to success. Patients have quality-of-life-based personal incentives to make better choices about how they manage their own behaviour and spending towards improved healthcare outcomes. This need for patient education is being increasingly recognised. Outcome measurements, such as patient reported outcome measures (PROMs), enhance a patient’s ability to judge which products improve their quality of life. Unlike with HCPs, immediacy of information and instant gratification are important to consumers. When patients or payers come to see the value of a C-Container, and perceive the cost to be appropriate, they will be more likely to buy it. Some HCPs and payers are already using C-Containers to help patients meet their individual, day-to-day needs. Patients are concerned about misuse of their health data and other personal information. Breaches of personal data security are occurring regularly, and security costs are escalating. A vision of extreme data abuse is detailed in the novel “Cell” by Robin Cook.3 Fortunately, such systematic, extreme abuses by payers have not occurred. While the possibilities for such abuse should be less than with a connected combination product, privacy and security concerns regarding C-Containers are still real. These concerns, along with the need for patient privacy and data security, have been one of the most intransigent obstacles to the flow of healthcare data and information to areas where it is most needed. Patient ownership and control of their own health data can help avoid the complex issues of data privacy by putting the data directly in the hands of the patient to use and reuse as they see fit. When data is owned and controlled by patients themselves, it can encourage patient-directed data use and reuse to create the information needed for them to make healthy choices. Patients can make important behavioural and clinical information available when and where it is needed. Having the patient be the primary custodian of their health data, streaming from multiple sources, can reduce the complexity of data transfer and lower costs. Patients control access, ensuring that their data is used how and by whom they want. Additionally, in terms of data security, aggregated information from multiple sources on one patient is far less a target for theft or abuse than information on thousands of patients in a corporate database. The stated primary objective of combination products is often patient-centricity, i.e. making pharma products more useful for the benefit of patients. Using a separate consumer product for connectivity as proposed here may benefit all stakeholders, but will benefit patients more than any of the others. The patient benefits of consumer software and C-Containers should not be unreasonably withheld. Many patients have already adopted consumer healthcare products (most frequently by purchasing them themselves). Regulators and other stakeholders are wrestling with how to approach the use and regulation of consumer software. Pharma and many others may benefit from embracing the use of truly patient-centric software and C-Containers without the various risks, complexity and costs of a connected combination product. The extremely low cost that stakeholders would like for a connected combination product or C-Container may never be met. Costs for both are driven by technical, manufacturing and logistical realities for creating and distributing a functioning connected product. The factors that drive the cost of a C-Container include design, component costs, validations, range, battery life, power consumption and user support. The addition of high overheads, multiple regulatory costs, legacy margins and other costs unrelated to the final product may be factors which limit the growth of connected combination products. Many concerns about connectivity were voiced by pharma at the October 2018 Parenteral Drug Association (PDA) Universe of Pre-filled Syringes and Injection Devices conference (Orlando, FL, US), as well as in the associated Combination Products Workshop P/L Biomedical President Lee Leichter’s course “Technical and Regulatory Challenges of Drug Delivery Combination Products”. The topic was also covered in a Cambridge Design Partnerships (Cambridge, UK) webinar on October 31, 2018, and in a November 20 announcement from Apple about co-operation with the US Veterans Administration on healthcare software. Many of the concepts discussed are generally understood, however content from some presentations and press contributed to some of the conclusions drawn in this article. As with all these types of events, much of the valuable information was exchanged in Q&A, personal conversations and follow-ups. In his presentation and conversations at PDA, Paul Jansen told of his personal experiences with connected combination products, discussed the criticality of the supply chain and briefed on ISO 20069, “Guidance for assessment and evaluation of changes to drug delivery systems”, the development of which he chairs. FDA executives engaged with the combination products also presented at PDA. A key point was that they advised of plans to issue a mobile medical device guidance, although no estimated timeframe was provided in response to an audience question.5 Subsequently, on November 19, 2018, FDA issued a notice of the establishment of a public docket for comments on software for prescription drug-related use. The notice states, in part, that “FDA recognises that digital health has the potential to offer new opportunities to improve patient care…”.6 This docket gives industry some information on FDA’s position and provides an opportunity for all stakeholders to help clarify the status of, and perhaps improve access to, C-Containers. Two posters at PDA, “What Plastic Bags Can do to our Devices: Something You Might Never Have Heard Before”, by Hemanth Amarchinta of Roche, and “Aging of Complex Systems: Fundamental Theory and Implications…”, by Nestor Rodriguez of Becton Dickinson, were remarkable for content about the known influencers of device performance which might not yet have been fully considered. In the Cambridge Design Partnership webinar, Head of Drug Delivery Uri Baruch discussed “unknown unknowns”.8 The managerial revolution has led to the proliferation of experts, all of whom are well trained but few of whom have personal experiences in the unknown unknowns of combination product development and manufacture. An analogy is that well-respected quantitative financial analysts failed to see the black swans in the 2008 housing loan market prior to its collapse. Pharma experts are generally not versed in the unknown unknowns of devices or consumer software. Smaller companies, which includes many app developers, often fail because they do not have adequate resources. The setting of healthcare standards, potential (as yet not fully realised) benefits of EMRs and sensor-based medical products are examples of industry benefitting from public initiatives. Learning from the pioneering healthcare work that comes from the DoD and the US Department of Veterans Affairs (VA) is nothing new, but it may be especially important for healthcare software and related products. Public organisations have long led in healthcare due to their aims and structural needs. I discussed these matters at length with Dr Stephen Ondra, founder of North Star Healthcare Consulting and formerly a senior official in the US Federal Government. The DoD and VA are among the largest providers of healthcare in the US, with taxpayers taking on the role of payers. Over the past several years, the DoD and VA have shared the goal of making their electronic medical records interoperable. As a result, when each chose to re-platform their ageing healthcare IT infrastructures, it was no surprise that they eventually picked the same EMR platform to simplify the task. Even with this however, true interoperability will remain a challenge due to different instances of their respective EMR implementations. This is an example of why a single EMR platform or format is not a realistic way to solve the problem of interoperability nationally. Additionally, such an approach is not even desirable for the commercial market. Such a move would not only raise anti-trust concerns, it would limit the innovation that is needed in a fast-moving space such as IT, which is spurred by private sector competition. Also, to be as robust and extensible as possible, healthcare data should come from multiple data sources and platforms. As such, interoperability will best be accomplished through approaches that allow the aggregation of data from multiple sources, alongside engines that can reconcile the various data streams and then pre-process it for downstream applications. An example of this was seen in an innovative approach that the Federal Government took in 2010 known as “Blue Button”. Led by VA, this application is an open-source and publicly available IT platform to allow individual consumers to aggregate their own personal health data from VA’s EMR, as well as other sources, in a simple ASCII file. This is a B-C-B (healthcare business to patient/consumer to patient-selected business) model, where the patient is educated and given the data from multiple Blue Button or other enabled sources to aggregate into a composite record. That data can then be used to power healthcare software application tools, share with the caretakers they want or with whomever and for whatever other use the patient feels would be helpful to them (Figure 1). Figure 1: The B-C-B model, whereby connected drug delivery products provide their data directly to the patient, who is then free to use and share that data according to their wishes. As a federal programme, Blue Button is available to anyone or any company in the US public or private sectors. Blue Button has been made available to beneficiaries of not only public health programmes, such as those of the DoD and VA, but more generally through the Centers for Medicare & Medicaid Services (CMS). The benefits of Blue Button have also been made available to private healthcare consumers from many payer and provider organisations. In contrast to this data platform-agnostic approach, the recent announcement by Apple is an example of a proprietary model approach.12 In this model, there is a B-B-C (healthcare business to healthcare business to consumer/patient) approach. By placing another business between the healthcare generated data and the consumer, concerns of privacy and security resurface, along with concerns of data being harvested for means that the patient may not want. Whilst benefits may certainly come from a large corporate entity managing health data, the use of a B-B-C model, as compared with a patient-centric, patient-owned data B-C-B model, should be looked at with some caution. Large conventional retailers’ brands are already falling prey to small companies that use innovative technology designed and positioned to meet individual consumer needs. Companies attuned to this personalised consumer service, once seen as interesting curiosities, are now profoundly shifting the consumer goods sector.13 Readers will already know that standards developers have published lists of procedures and diagnosis codes, and that FDA has recently mandated the use of automated information and data capture symbologies for prescription pharma and high-risk medical devices, which provide language sets for use in EMRs. Consumers can already use their smartphones to capture some product information, so it is no great leap to assume that some company, small or large, will empower patients to use some version of procedure codes, diagnosis codes, and standardised drug and medical device symbologies. Separating the C-Container from the drug regulation can improve time to market and reduce regulatory and product liability risks. Such separation can eliminate the need for pre-launch regulatory approval, so long as regulators exercise regulatory discretion towards consumer products or affirmatively declare policies enabling their use. Multi-product platforms and personalised versions of products are more easily achieved with consumer products. C-Containers can still enhance the pharma revenue stream and patient loyalty. C-Containers can help ensure regimen compliance and even combination product reliability by having experts in patient needs and device manufacture design them according to the requirements of patients and their devices. Approved digital therapeutics allow patients to self-diagnose, enabling home treatment. More such therapeutics are emerging, which will expand the potential appropriate use of C-Containers . C-Containers can be designed, tested and documented as though the C-Container were a medical device to allow ongoing future development of more highly regulated medical devices with added claims. Contracts can allow appropriate oversight of the C-Container by a pharma company without it becoming a connected combination product. Differentiated C-Containers can be platforms for multiple combination products from a given company, thereby bringing economies of scale and lower costs. Sequential, not simultaneous, development of connectivity is often more appropriate for emerging products. As with the automotive and other consumer industries, pharma can learn from consumer industry techniques using C-Containers as it moves into customer digitisation, to assisted intelligence and subsequently to automated intelligence. As shown, connecting combination products for drug delivery to the internet in ways other than fully integrated connected combination products can improve patient outcomes and provide benefits to other stakeholders. C-Containers could be just the tool to provide those benefits more quickly and efficiently. C-Containers can even help ensure that pharma products are safer and more effective. Public healthcare IT initiatives which will further enable the use of C-Containers being implemented. This article reflects the author’s personal opinions and analysis. It is not a professional interpretation of any medical, regulatory or legal requirements. 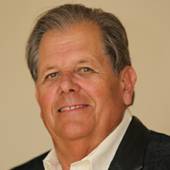 The author, licensees to his intellectual property and his clients have interests in healthcare with a focus on medication telemanagement. Grom T, “Trend: Creating Shared Value”. PharmaVOICE, Nov/Dec 2018. Miller HI, “Follow the FDA’s Self-Interest”. Wall Street Journal, Oct 2018. Cook R, “Cell”. Putnam, 2014. Leichter L, “Technical and Regulatory Challenges of Drug Delivery Combination Products”. PDA Course at Prefilled Syringes and Injection Devices Conference, Orlando, FL, US, Oct 2018. Dorgan C, Mollo S, FDA presentations at the PDA Combination Products Workshop, Orlando, FL, US, Oct 2018. “Prescription Drug-Use-Related Software; Establishment of a Public Docket; Request for Comments”. US FDA, Nov 2018. Upham P, “Pharma silos, and fragmented and conflicting objectives of various stakeholders inside and outside may lead to the failures of connectivity”. PDA Universe of Prefilled Syringes and Injection Devices Conference, Orlando, FL, US, Oct 2018. Baruch U, Cambridge Design Partnerships Webinar, Oct 2018. Chang S, “US military is the largest employer in the world”. MarketWatch, Jun 2015. Willings A, “27 Military technologies that changed civilian life”. Pocket-lint, Feb 2018. “Military use of consumer technology: War games”. The Economist, Dec 2009. Kesling B, Mickle T, “Apple in Talks to Give Veterans Access to Electronic Medical Records”. Wall Street Journal, Nov 2018. “A handmade tale: The growth of microbrands threatens consumer-goods giants”. The Economist, Nov 2018.